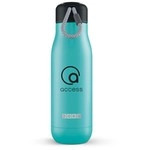 Dual Opening Tritan Custom Water Bottle - 21 oz. This Tritan Custom Bottle Survival Kit is ideal for your next safety meeting or conference! It features critical outdoor necessities. Hydrate Double Wall Custom Sports Bottle - 20 oz. Be forever refreshed as long as you carry this great 20 oz. Hydrate Double Wall Custom Sports Bottle around! Perfect for schools, walk-a-thons, fundraisers and more! Tritan I-CY H20 Custom Water Bottle - 20 oz. This Tritan I-CY H20 Custom Water Bottle proves that when your logo looks good, you look good. Single Wall Tritan Custom Water Bottle - 24 oz. Single Wall Tritan Custom Water Bottle can easily be imprinted with your company name and logo. EKClear Custom Sport Bottle - 25 oz. A custom sports bottle with a generous 25 oz. capacity that is perfect for the gym or sports. EKColor Custom Sport Bottle - 25 oz.